When actors lose a bunch of weight for a role it feels gimmicky, more often than not. It’s such an easy ploy and too often used as a launching pad for an Oscar campaign that it’s become kind of a joke. If Tropic Thunder were made today, the “full retard” speech would undoubtedly include a line about weight loss. So when Jake Gyllenhaal started showing up places looking gaunt, I felt a thread of dismay. Oh no, I thought, not him. He’s not THAT kind of actor. 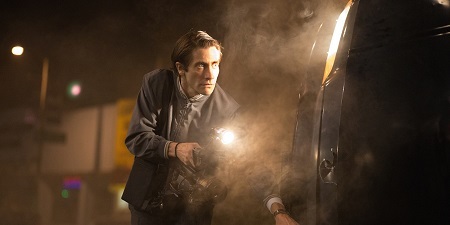 He lost the weight for Nightcrawler, the directorial debut of screenwriter Dan Gilroy (The Bourne Legacy), a movie about a creepy guy, Lou Bloom, who works as a freelance videographer, recording gruesome crash footage and crime stories for the local news. And Gyllenhaal’s physical transformation is an essential part of what is a career-best performance. 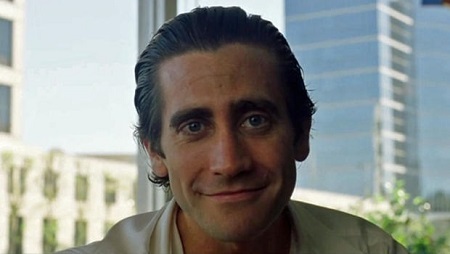 The contrast of Gyllenhaal’s matinee idol looks and his skinnified frame is unnerving from the beginning. Lou Bloom has a veneer of likeability—his smile is kind of charming, his blue eyes are bright, he dresses neatly. But those outer trappings quickly give way to his disturbing true nature. With his hair slicked back, protuberant eyes, and bulging veins in his forehead, the initial impression he makes is overwritten by unease and, ultimately, disgust. Lou Bloom is ambitious and amoral, guided by a set of personal principals cribbed from a self-help book and utterly divorced from human emotion. Gyllenhaal looks hungry physically, an outer echo of the hunger for more that drives Lou Bloom. 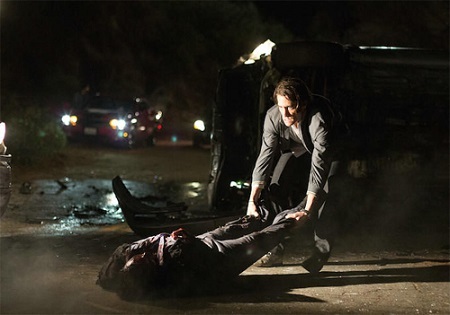 Nightcrawler is a profoundly disgusting film, the kind that makes you want a shower as you leave the theater, and yet, it isn’t particularly graphic. There are moments of brutality but Gilroy and cinematographer Robert Elswit (The Bourne Legacy, There Will Be Blood) don’t dwell on them. It isn’t seeing someone get shot, or the aftermath of a car accident that disturbs—it’s how Bloom reacts to these events that leaves you cringing from the screen. For instance, when Bloom comes upon a car accident before emergency services arrive, he moves the body of the victim in order to get a better shot for the news (echoes of Civil War photographer Mathew Brady repositioning dead soldiers on battlefields in order to create more sensational images). It’s an incredibly hard moment to watch, and it’s purely due to moral disgust, not gore. Gilroy’s script is excellent. 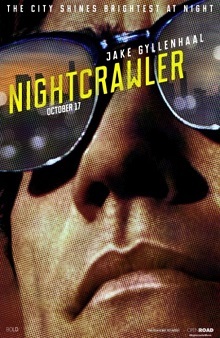 Best known for action fare like The Bourne Legacy and Real Steel, Nightcrawler is a kind of revelation—studio producers should get out of this guy’s way. And his direction is also good; partnered with an experienced action DP like Elswit, he stages some great car chase sequences. But he also has a light touch with actors. Gyllenhaal delivers dialogue in long monologues and Gilroy wisely lets the camera sit with him, using long, steady takes to capture Bloom in all his intensity. Rene Russo is great as local news producer Nina, whose “if it bleeds, it leads” mantra pushes Bloom to ever more upsetting lengths to get the shot. Nina and Bloom have a series of increasingly uncomfortable scenes, culminating in an ill-advised date in which Bloom flat-out blackmails her into a sexual relationship, but when Bloom brings her the bloody aftermath of a triple homicide, Nina seems legitimately aroused by him. It’s revolting, but also a delight to watch two good actors really getting into it together. That scene is electric. Also standing out is Riz Ahmed (The Reluctant Fundamentalist) as Bloom’s ill-fated sidekick, Rick. But this is Gyllenhaal’s show from beginning to end—literally, he’s in nearly every frame. Gyllenhaal broke out playing a weirdo in Donnie Darko, then went on to a series of weirdo-youth roles in Bubble Boy (shut up, it’s a cult classic) and The Good Girl, before trying his hand at mainstream movie stardom. Bounced out of the mainstream by an under-appreciative public (you ingrates! ), he’s gone back to intense character work and is now taking gold in the Weirdo Olympics as Lou Bloom. This is a performance for the film history books, and one that Gyllenhaal inhabits totally. He speaks like he’s reciting passages from self-help tapes and looks like a washed-up travelling salesman, but in the end, Nightcrawler is the story of Bloom’s success. His reward for his unrelenting creepiness and moral vacuum is an expanding business and a TMZ-like future. Gyllnehaal’s reward for so effortlessly and completely being Lou Bloom ought to be all the trophies in the Hollywood vault, but it probably won’t be. But then, stranger things have happened. My husband should love this film. He loves all horror films pre 1980. This seems like a 70s film or tv show. I wonder what makes it fresh now. It definitely has a 70’s vibe, with the character-driven moral dubious storyline and all, but I think why it feels so “new” is Jake G’s performance. It makes the entire movie. Thanks. Jake G looked mesmerizing in the clip I saw on The Daily Show last night. Jake is terrific in this film. 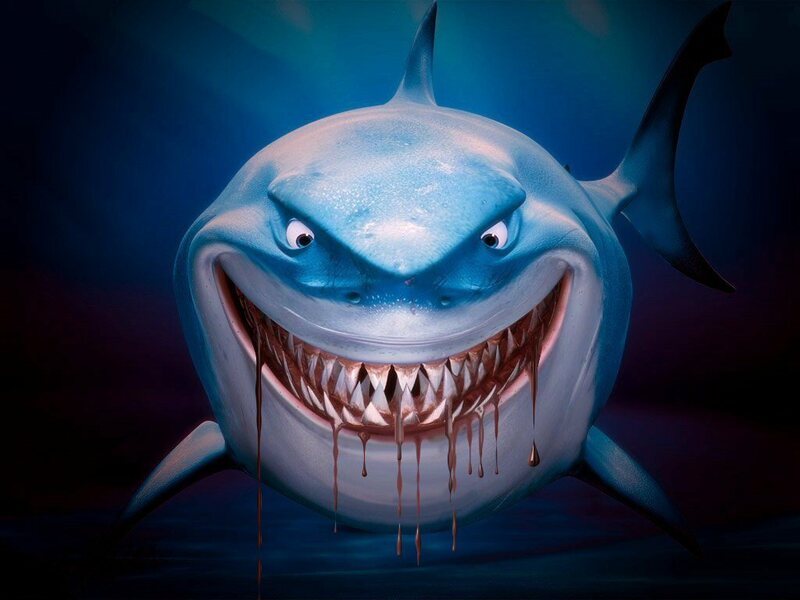 I didn’t love the movie because I thought its message about news media and sensationalism is something most savvy consumers of media are aware of…it felt sort of empty. But Jake, oh Jake is damn tremendous. I was skeptical about the weight loss prior to seeing the movie but when I saw the film, I loved it. The gaunt face of Lou managed to convey the desperate hunger of his ambition and his ghoulish nature. I was riveted by his performance even as it made me sick to my stomach. I saw the movie two weeks ago and I am still thinking about/disturbed by that performance. Do you think he has a chance at an Oscar nod? My boss took the whole office to see this film in lieu of an actual holiday party. Eight pretty different people from various demographics and we all agree: Jake Gyllenhaal is amazing. He was like a cross between Amazing Amy and the Joker. So glad he got two nominations this week for this film.